Listed below are just a few configurations made possible through Slide-Lok’s stackable/modular garage storage cabinet design. Your Slide-Lok of Milwaukee Dealer will be happy to assist you with installation of your Slide-Lok garage storage solution. 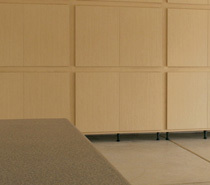 Click here to contact your Milwaukee Slide-Lok Garage Interiors & Storage Cabinets dealer. Slide-Lok can help you achieve your garage storage goals. Industry leading garage storage cabinets installed quickly and cost-effectively. Request a Free Estimate for Your Garage System! *TAX not included. Limit one per customer. Natural maple only. Cannot be combined with any other offer. Garage storage cabinets and garage organization solutions. Storage, Cabinets, Garage, Floor, Coatings, Overhead, Racks, Classic, Natural Maple, Colors, wood grain, and more. Contact us. Slide-Lok of Milwaukee and Slide-Lok of SE Wisconsin serves the following areas around Milwaukee, Wisconsin: Shorewood, Glendale, Bayside, Brown Deer, Wauwatosa, West Allis, Greenfield, Greendale, Cudahy, Oak Creek, Franklin, Muskego, New Berlin, Brookfield, Menomonee Falls, Germantown, Mequon, Caledonia, Racine, Mt Pleasant, Cedarburg, Grafton, Fichfield, Sussex, Pewaukee, Waukesha. Contact us for your free estimate on installed or DIY storage cabinets. Also offering, Garage Floor Coatings, Garage Storage, Cabinet Systems, Overhead storage racks, Plywood storage cabinets, storage cabinet systems.... Click here for our sitemap.